What became clear in 2018 is the direct impact of politics on the world’s stock markets. The growing nationalism popping up, especially since the rise of political populists and authoritarian rulers, stands in direct contrast to the understanding of democracy that has been lived up to now, at least in the so-called “first world”. To date, this has entailed a belief in the need for international cooperation, including the resulting globalisation. This seems to be getting out of hand, especially in view of those politically powerful people who have triggered some of the unresolved crises – such as Brexit, Italy’s budget dispute with the EU, various wars, growing customs disputes, interest rate increases by central banks, etc – with their unpredictability. The continuing mixed situation beyond the turn of the year on the stock markets led directly to uncertainty and nervousness. In some cases it even headed to more dangerous paralysis (see the U.S. budget dispute). The international stock markets will not recover until confidence and security are restored. However, at the time of writing this seems far from the case. According to Johannes Hirsch (Managing Director of German asset management company Antea AG) the rapid ups and downs will probably continue for some time: “We are in turbulence, there is still a lot more to come”. At the same time, however, he also reassures: a gap of 20 percent between the high and low for the year isn’t unusual. However, there were – albeit delayed in comparison to the rest of the world – big headaches in USA. In the first half of 2018 everything looked great. Thanks to a passed tax reform, the U.S. stock markets rode from one record high to the next. But as soon as the US Federal Reserve Fed raised key interest rates step-by-step, a collective downhill started. Due to a flashcrash in December – normally always marked by “good news” in the wake of the year-end rally – the last month of 2018 ended into the worst since the Great Depression in 1931. This will surely be seen by Americans as a “December to remember” for a long time to come. The only positive aspect is that while the Euro-Stoxx-50 went down a two-digit 16.2 percent (as many other European country indexes too), the U.S. stock indexes ended the year – due to its record performance in the first half of 2018 – in single digit drops. 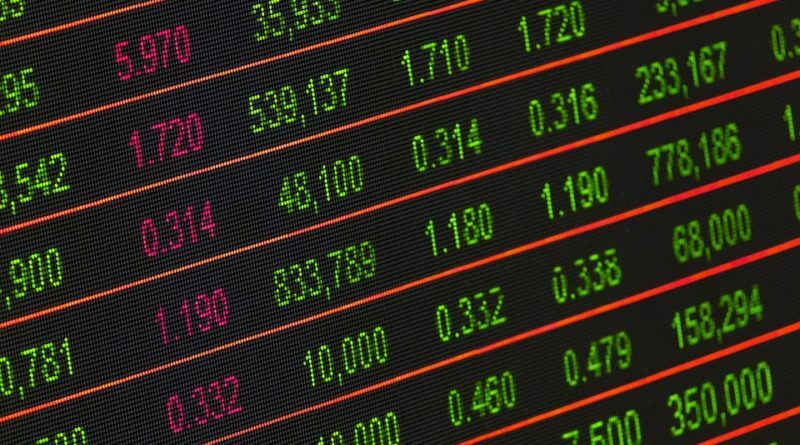 The Dow Jones – the stock index with the 30 most important domestic stocks – was down 5.6 percent at the end of 2018, the S&P 500 – the stock index of the 500 largest listed domestic companies – down 6.2 percent and the Nasdaq – the price index with the 100 listed non-financial companies – down 4.0 percent. Europe’s strongest market, Germany, was also slowed by the hitherto unresolved diesel scandal. 7.7 percent of Germany’s total economic output is directly or indirectly attributable to automobile production. According to Heinz-Rudolf Meißner (board member of the Research Association for Foreign Trade, Structural Policy and Technology Policy in Berlin), in Germany approximately “1.8 million jobs are directly or indirectly dependent on car production”. Suppliers would account for four fifths of the added value in that industry. Our bike chart member Continental AG is one of those companies directly affected by the automotive crisis. With last year’s 46.6 percent share value drop, Conti is one of our top five losers in our 2018 bicycle chart. What does this all mean for our international 2018 bike stock chart? 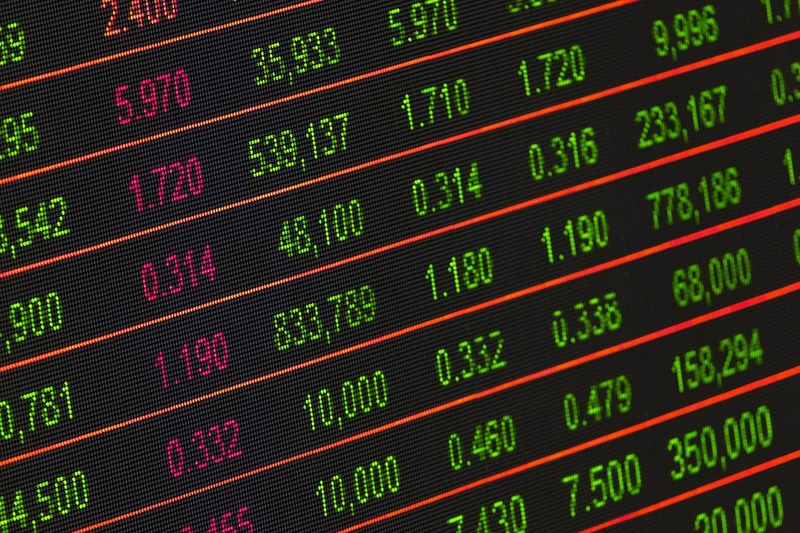 21 of our all in all 29 listed share values (= 72.4 percent) ended 2018 with a loss. And they had it in them. 20 of these 21 chart members with share value drops (= 95.2 percent) made double-digit losses. The top five losers are led by Atlas Cycles from India with minus 64.2 percent, followed by Shanghai Forever maker Zhonglu (minus 51.4 percent), bicycle component maker Sun Race Sturmey-Archer (minus 49.3 percent), bike producer Ideal (minus 48.4 percent) and Conti (minus 46.6 percent). It should be noted here that Taiwan’s component supplier Sun Race Sturmey-Archer was by far the winner of the 2017 bike stock chart with a share plus of over 300 percent – and thus still operates at a high level even after the two-digit 2018 loss mentioned above. Countryman Ideal, on the other hand, was hit at the end of the year by Advanced Sports Enterprises’ (ASE) file for bankruptcy under Chapter 11. ASE is the umbrella company of Advanced Sports International (ASI), the bicycle wholesale company responsible for the Breezer, Fuji, Kestrel, SE Bikes and Tuesday Cycles bicycle brands as well as the Oval Concepts parts brand. ASE isn’t only the umbrella of ASI, but also Performance Bicycle. Ideal is not only ASE’s production partner, but also holds a 17 percent stake in ASE and a 50 percent stake in ASI. Thus, Ideal is also directly affected by the ASE bankruptcy in USA. Finally some positive news: Eight of our 29 bicycle chart values successfully braced themselves against the 2018 stock market downhill. 50 percent of these winners even ended last year with a double-digit plus. 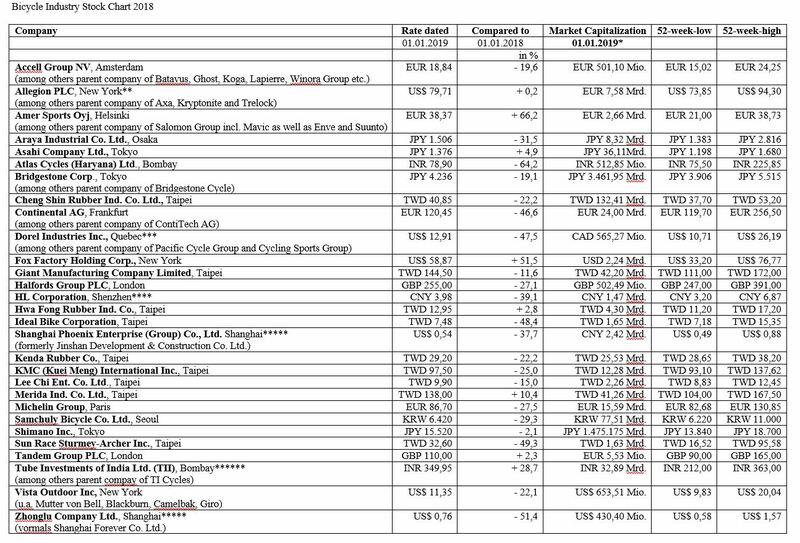 Mavic and Enve parent company Amer Sports leads the top-four with plus 66.2 percent followed by Fox Factory (plus 51.5 percent), TI Cycles’ parent company Tube Investment of India (TII, plus 28.7 percent) and Merida (plus 10.4 percent). Amer shares benefited from the official takeover bid submitted by an investor consortium around Anta Sports from China at the end of 2018. 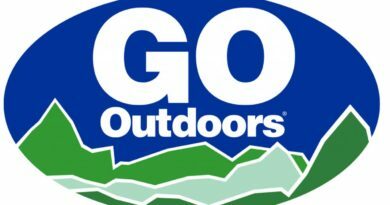 Mascot Bidco Oy, which was established specifically for the takeover, will pay €4.6 billion for the entire outstanding issued share capital of Amer Sports. This corresponds to a value of €40 per share. If the shareholders approve this offer, Mascot will take over the sporty Mavic and Enve parent company and take it off the stock exchange. By the way: Amer remains committed selling its bicycle business under the Mavic and Enve brand names after a strategic review. Suspension expert Fox Factory, on the other hand, benefits above all from its suspension products for its special vehicle division. Even though the bicycle business is doing very well, the main business is certainly currently benefiting from the growing demand for military vehicles. The upswing in the TII share is more rooted in the growing business with metal moulded parts for the railway, automotive, motorcycle and other industries, than to the TI Cycles bicycle business. This business is still subject to a reorientation, which was bagged in view of declining demand and the associated decline in total production volume. According to the company, both production infrastructure and costs will be greatly rationalised in the future. Taiwan’s number two bicycle producer, Merida, was able to increase its share value with the help of its increasing e-bike production at its Taiwan headquarters’ factory. 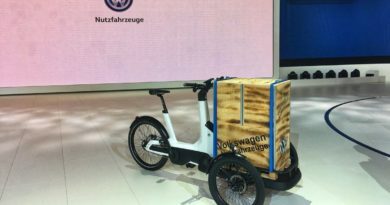 These e-bikes for the western world are higher in value than conventional bicycles.